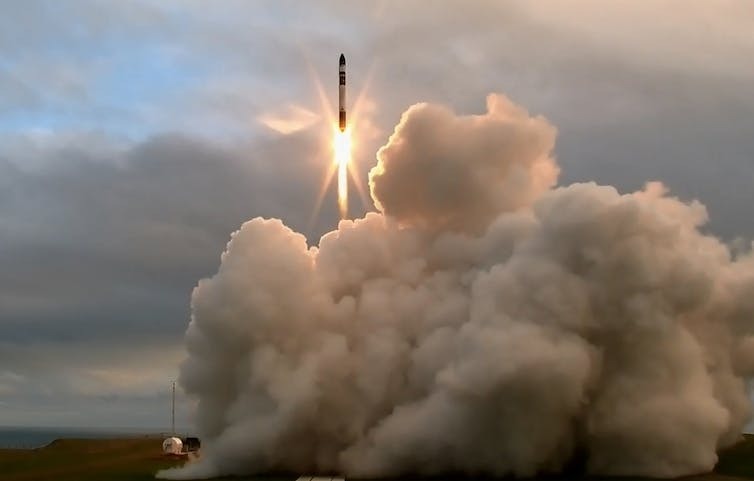 The rocket that blasted into space from New Zealand on May 25 was special. Not only was it the first to launch from a private site, it was also the first to be powered by an engine made almost entirely using 3D printing. This might not make it the “first 3D-printed rocket in space” that some headlines described it as, but it does highlight how seriously this manufacturing technique is being taken by the space industry. Members of the team behind the Electron rocket at US company RocketLab say the engine was printed in 24 hours and provides efficiency and performance benefits over other systems. There’s not yet much information out there regarding the exact details of the 3D-printed components. But it’s likely many of them have been designed to minimise weight while maintaining their structural performance, while other components may have been optimised to provide efficient fluid flow. These advantages – reducing weight and the potential for complex new designs – are a large part of why 3D printing is expected to find some of its most significant applications in space exploration, with dramatic effect. One thing the set of technologies known as additive manufacturing or 3D printing does really well is to produce highly complicated shapes. For example, lattice structures produced in exactly the right way so that they weigh less but are just as strong as similar solid components. 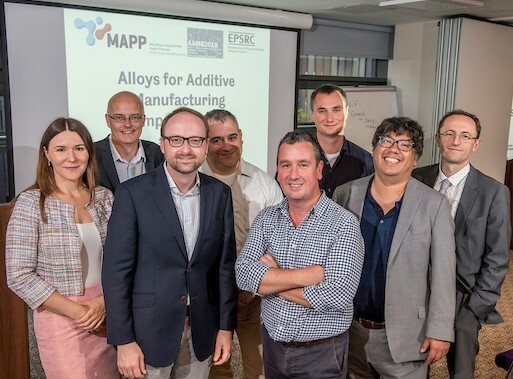 This creates the opportunity to produce optimised, lightweight parts that were previously impossible to manufacture economically or efficiently with more traditional techniques. Boeing’s microlattice is an example of taking this to the extreme, supposedly producing mechanically sound structures that are 99.9% air. Not all 3D printing processes can achieve this, but even weight savings of a few percent in aircraft and spacecraft can lead to major benefits through the use of less fuel. 3D printing tends to work best for the production of relatively small, intricate parts rather than large, simple structures, where the higher material and processing costs would outweigh any advantage. For example, a redesigned nozzle can enhance fuel mixing within an engine, leading to better efficiency. Increasing the surface area of a heat shield by using a patterned rather than a flat surface can mean heat is transferred away more efficiently, reducing the chances of overheating. The techniques can also reduce the amount of material wasted in manufacturing, important because space components tend to be made from highly expensive and often rare materials. 3D printing can also produce whole systems in one go rather than from lots of assembled parts. For example, NASA used it to reduce the components in one of its rocket injectors from 115 to just two. Plus, 3D printers can easily make small numbers of a part – as the space industry often needs – without first creating expensive manufacturing tools. 3D printers are also likely to find a use in space itself, where it’s difficult to keep large numbers of spare parts and hard to send out for replacements when you’re thousands of kilometres from Earth. 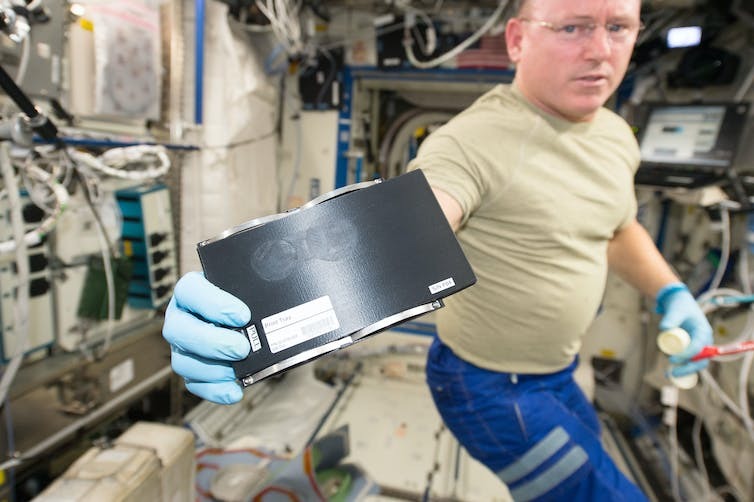 There’s now a 3D printer on the International Space Station so, if something breaks, engineers can send up a design for a replacement and the astronauts can print it out. The current printer only deals with plastic so it’s more likely to be used for making tools or one-off replacements for low-performance parts such as door handles. But once 3D printers can more easily use other materials, we’re likely to see an increase in their uses. One day, people in space could produce their own food items and even biological materials. Recycling facilities could also enable broken parts to be reused to make the replacements. Looking even further ahead, 3D printers could prove useful in building colonies. Places like the moon don’t have much in the way of traditional building materials, but the European Space Agency has proven solar energy can power the production of “bricks” of lunar dust, which would be a good start. Researchers are now looking at how to use 3D printing to take this idea further and develop complete printed buildings on the moon. To make many of these applications a reality, we’ll need to research more advanced materials and processes that can manufacture components to withstand the extremely harsh conditions of space. Engineers also need to work on developing optimised designs and find ways of testing 3D printed parts to prove they’re safe. And then there’s the irritating issue of gravity, or rather the lack of it. Many current processes use powders or liquids as their raw materials so we’re likely to need some clever tricks in order to make these function safely in a low or microgravity environment. Some of these barriers may even require entirely new materials and techniques. But as research goes on, 3D printing is likely to be used more and more in space, even if a fully printed space vehicle isn’t going to launch any time soon. The sky is no longer the limit.